In July 2016, a salvage excavation was conducted in the Silwan neighborhood, on the eastern slope of the Mount Zion spur, east of the street that encircles the Old City (Maʽale Ha-Shalom St.; Permit No. A-7744; map ref. 221999–2009/631080–106). 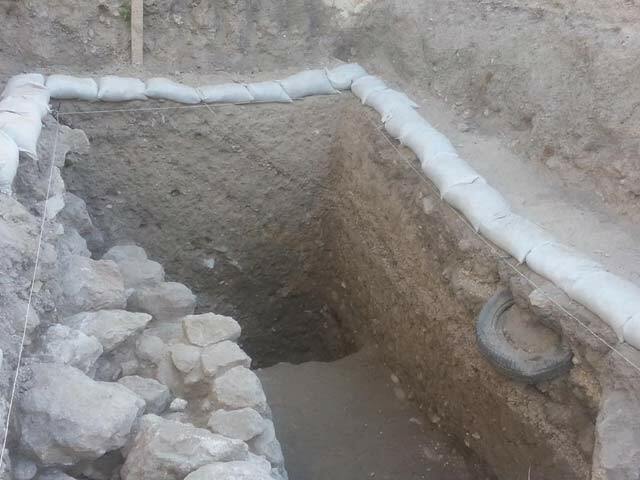 The excavation, undertaken on behalf of the Israel Antiquities Authority and financed by the land tenant, Mr. Mahmud Gol, was directed by S. Kisilevitz, with the assistance of N. Nehama (administration), B. Touri (safety), V. Essman, Y. Shmidov and M. Kahan (surveying), N. Sapir (inspection and scientific consultation), A. Re’em, Y. Zelinger and E. Kagan (scientific consultation), A. de Vincenz (pottery reading), I. Lidsky-Reznikov (pottery drawing), C. Amit (studio photography), R. Cohen-Amin (finds registration) and laborers provided by the contractor. Strata from the Early Roman, Byzantine and Early Islamic periods were exposed, as well as modern finds. 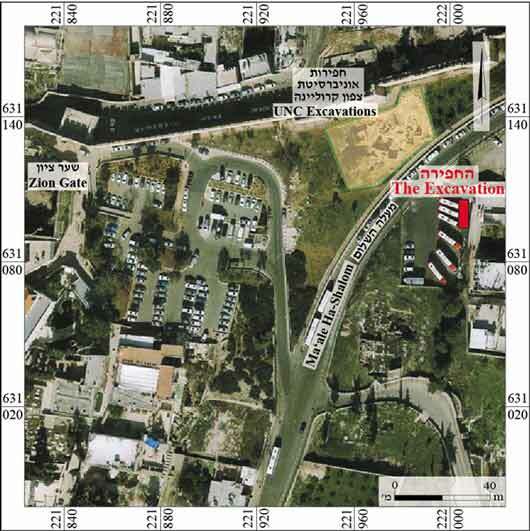 The excavation area was located at the eastern end of a privately owned parking lot, east of Maʽale Ha-Shalom Street and southeast of Zion Gate (Fig. 1). Several months prior to the excavation and after a rickety fence separating a parking lot from residential buildings was dismantled, a trench (length c. 20 m, width c. 3 m, depth 1.5–3.5 m) was mechanical dug in preparation of constructing a new fence. A large amount of modern debris remained in the excavated strip, and archeological fills were discerned at the bottom of the probes opened to the west and east, thereby necessitating a proper excavation. The southern slopes of Mount Zion, where the excavation took place, was extensively excavated in the past, revealing archaeological remains from numerous periods (Broshi and Gibson 1994; Broshi 1976a; 1976b). Some 60 m northwest of the current excavation, an expedition of the University of North Carolina (UNC, see Fig. 1) uncovered remains dating from the Second Temple period to the Middle Ages (Gibson 2010; Gibson, Lewis and Tabor 2016). Remains from the Second Temple period, the Byzantine period and the Middle Ages were discovered between Dung Gate and Zion Gate (Margovsky 1970; 1971a; 1971b). Several of the earliest excavations in Jerusalem (Bliss and Dickie 1898) and recently conducted ones (Zelinger 2010; Zelinger 2011) unearthed fortifications from the Iron Age II(? ), the Second Temple period and the Byzantine period, as well as remains from the Roman and Ottoman periods. 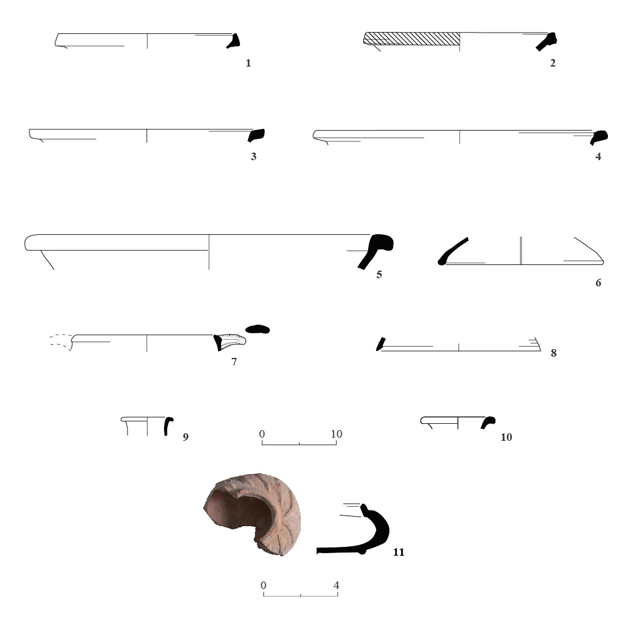 The excavation was conducted in a small area (length 5 m, width 2.5 m; Fig. 2) in the northern part of the strip that was dug by the contractor. Most of the area was excavated to a depth of c. 2 m; a probe (c. 1 × 2 m; Fig. 3) in the northeastern corner was excavated 1.5 m deeper. The narrow strip dug by the contractor delimited the excavation area, and high balks in the strip were retained due to safety constraints. Seven strata (7–1), which seem to date from the Early Roman to the Early Islamic periods, were identified, as well as a modern disturbance. Strata 7–4 were discerned only in the probe. Stratum 7. A section of a fill descending eastward was exposed in a small area (L104; c. 1 sq m) at the northern end of the excavation: a white layer of crushed plaster chunks, some of which bear the remains of a fresco painted in white, red and green (Fig. 4). Although the fill, excavated only several centimeters down, yielded no diagnostic pottery sherds, and despite the smashed state of the plaster fragments, the style of the frescos suggests that they come from a building dating from the Early Roman period (first century BCE – first century CE), as do some of the frescoes discovered in situ in the courtyard of the Armenian monastery on Mount Zion (Broshi 1976a:58, Pl. III). Stratum 6. An ashlar-built wall (W105; Fig. 3) aligned in a northwest–southeast direction was constructed on top of the crushed plaster fill and preserved to a height of one course. Only a small section of a large ashlar and the edges of similar ashlars on both its sides were exposed. 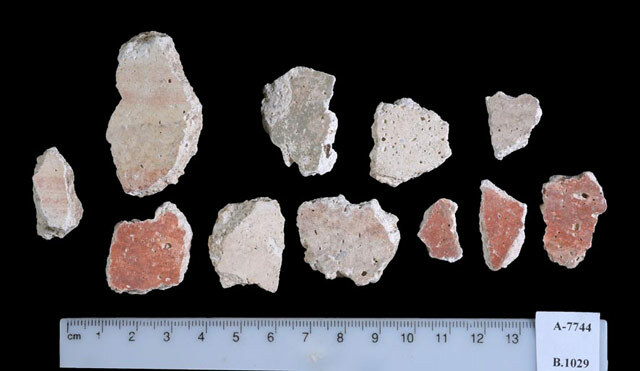 The crushed plaster fill (L104) may have served as a foundation for the wall and a bedding for an adjoining level, but the latter did not survive. Stratum 5. 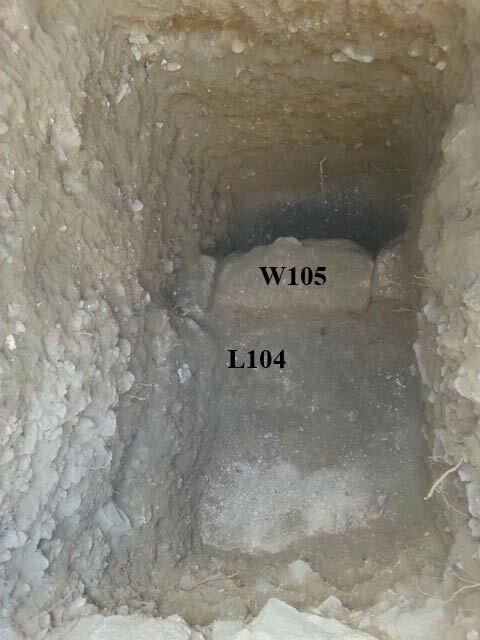 A light-colored grainy layer of soil (L103) that descended gently to the east covered the western part of W105. The stratum was rich in finds, including numerous small shells, small fragments of glass vessels from the Byzantine period, a fragment of a marble vessel, part of a metal knife (Fig. 5) and a bone object (Fig. 6), as well as numerous pottery sherds from the Byzantine period (fourth–fifth centuries CE). These included a bowl (Fig. 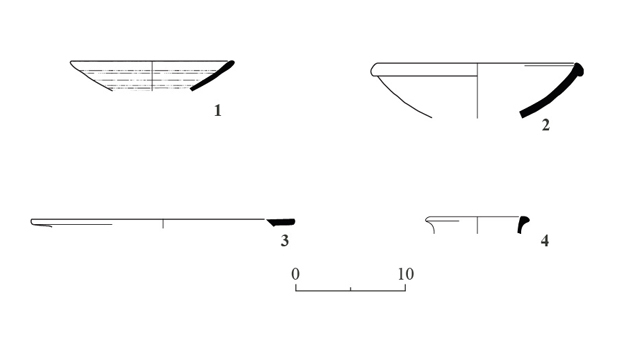 7:1–5), a bowl lid (Fig. 7:6), a cooking pot (Fig. 7:7) and a cooking pot lid (Fig. 7:8), jugs (Fig. 7:9, 10) and a lamp (Fig. 7:11). Stratum 4 yielded a horizontal stratification of dark brown earth alternating with thin layers of small fieldstones (L106) that cut through Stratum 5. This stratum covered the eastern part of W105, and its eastern side continued to a depth of at least 0.7 m below the top of the wall. The excavation was halted at this depth because of the limited area and safety concerns. A large quantity of pottery was found. The latest sheds are characteristic of the transition from the Byzantine period to the beginning of the Islamic period (second half of the seventh century CE, the Umayyad period) and included bowls (Fig. 8:1–3), a handle of a bowl lid (Fig. 8:4), jugs (8:5, 6) and jars (Fig. 8:7–9). This stratification apparently severed the light-colored fill of Stratum 5 (L103, the Byzantine period) to its west, and it seems to be the fill within a robber trench of W105. Stratum 3. The eastern face of a broad, massive retaining wall (W102) was exposed; its western face was situated beyond the limits of the excavation. The wall was founded on a thin layer of homogeneous brown soil (L101C) that sealed the light-colored fill of Stratum 5. The wall ran in a general north–south direction and continued the length of the square (5 m); its northern part curved to the northwest (Fig. 9). The wall, which was preserved to a maximum height of five courses, was built of fieldstones, some of which were roughly hewn, and contained several building stones in secondary use. The curve discerned at its northern end was either a construction meant to conform to the topography or the result of a gradual collapse of the wall over the years due to the weight of the soil above it. Pottery sherds—including bowls (Fig. 10:1–3) and a jug (Fig. 10:4)—characteristic of the late Byzantine period to the eighth century CE (the Abbasid period) were found in the brown soil upon which the wall was founded. In the stratified soil at the foot of the wall were sherds dating from the Abbasid period (Stratum 2; below), and therefore we suggest it was constructed at that time. Stratum 2. 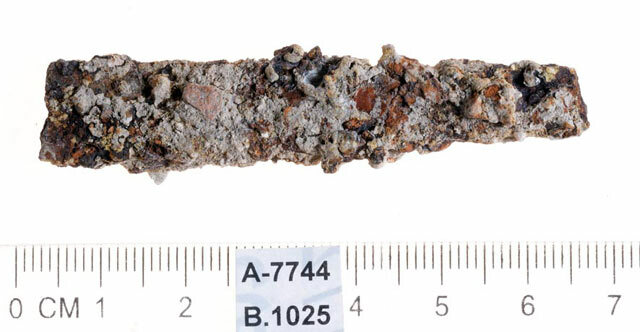 An accumulation of layers of brown soil with thin layers of gravel (L101A, L101B) was exposed east of Retaining Wall 102 and above it. The layers descended eastward at a steep incline (c. 50 degrees) unlike the accumulation in Stratum 4, below these layers, which was relatively level. It thus seems that the gradient was created by the accumulation of these layers against the east face of the retaining wall; hence, they postdate the construction of the wall. It was impossible to determine whether this was a natural, gradual accumulation or soil that was deliberately piled from west to east. Nevertheless, the layers contained numerous potsherds dating from the Iron Age to the Early Islamic period (the Abbasid period), thereby reinforcing the assumption that the soil was brought from various places and intentionally deposited. The sherds from the Abbasid period (eighth–tenth centuries CE) comprise mostly glazed bowls of various colors—yellow (Fig. 11:1), yellow and green (Fig. 11:2, 3) and black on a yellowish white background (11:4), a type that may have continued into the Fatimid period (tenth–eleventh centuries CE); a large bowl adorned with no slip bearing a combed decoration (Fig. 11:5); and buff-ware jugs (a jug handle, Fig. 11:6). One bowl (Fig. 11:7) resembles the carinated bowls of the Mamluk period; however, it was not glazed and may be an early type of these vessels. Stratum 1. A modern disturbance (L100) cut through the eastward descending layers of Stratum 2. It was identified in two places: in the northwestern corner of the excavation, where the southeastern end of a pit that extended beyond the limits of the excavation was discerned, and in the eastern part of the excavation, where another pit descended southeast and continued outside the excavation area. These were two modern refuse pits, containing dark brown earth, chunks of concrete, plastic bags and bottles and even a tire, found in the southeastern corner. This stratum was related to the construction of the modern fence when the parking lot was first built to the west. Although the excavation was limited to a small area—about half of ​​an excavation square—it yielded archaeological strata rich in finds; their dates span a very long time, from the Early Roman period to the modern era. These discoveries augment the archaeological finds from other excavations on the slopes of Mount Zion, which together attest to extensive human activity in the region during these periods. Two finds are particularly interesting: the fresco fragments, which probably originated in Second Temple-period mansions at the top of the slope, several of which were excavated by Margovsky (1970) and Broshi (1976a:58, Pl. III); and the retaining wall and the stratified fills that formed a steep gradient on its eastern side, which probably date from the Early Islamic period. Broshi M. 1976b. 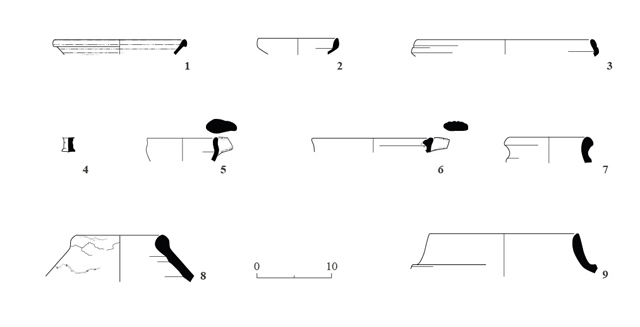 Excavations on Mount Zion, 1971–1972 (Preliminary Report).IEJ 26:81–88. Margovsky Y. 1970. Jerusalem, Soundings near Burj Kabrit. HA 36:14 (Hebrew). Margovsky Y. 1971a. Jerusalem, Mount Zion. HA 37:19–20 (Hebrew). Margovsky Y. 1971b. Jerusalem, Mount Zion (Gallicantu Road). HA 38:15–16 (Hebrew). Zelinger Y. 2010. Jerusalem, the Slopes of Mount Zion. HA-ESI 122. Zelinger Y. 2011. Jerusalem, Mount Zion. HA-ESI 123. 4. 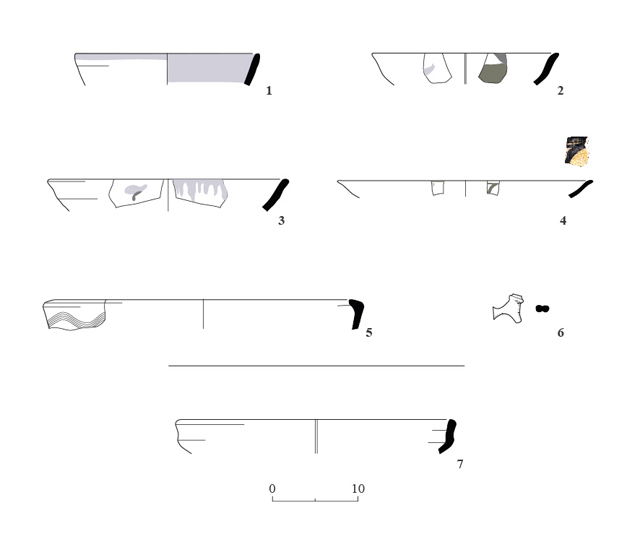 Fragments of decorated plaster (fresco) from the white layer in Stratum 7. 5. A metal knife from L103. 6. 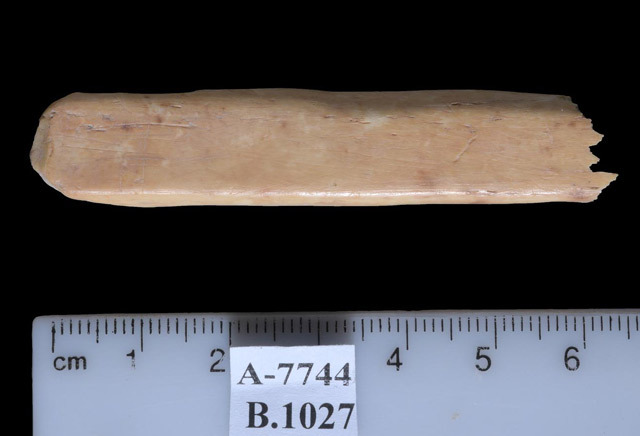 A bone object from L103. 7. Pottery from the Byzantine period (L103). 8. Pottery from the late Byzantine period until the seventh century CE (L106). 9. Wall 102 and Layers L101A, L101B, looking northwest. 10. Pottery from the late Byzantine period until the eighth century CE (L101C). 11. Pottery from the Abbasid period (L101B).